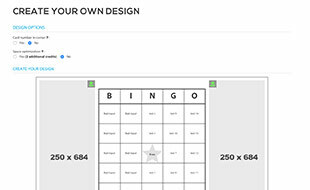 This web application enables you to make personalized bingo cards, create the design by importing images around the cards and play a game with the online bingo caller. You can also simulate a bingo game and predict the winners. You can get help at any step of the process by watching the video tutorials. your First Try is Free! When using this Web application, you accept the terms and privacy.